Looking for a soup that takes 30 minutes to make, yet tastes like you simmered it all day? This Cilantro Lime Chicken Soup is just what you need on a chilly winter day! During these winter months, my husband and I crave soup on a daily basis. 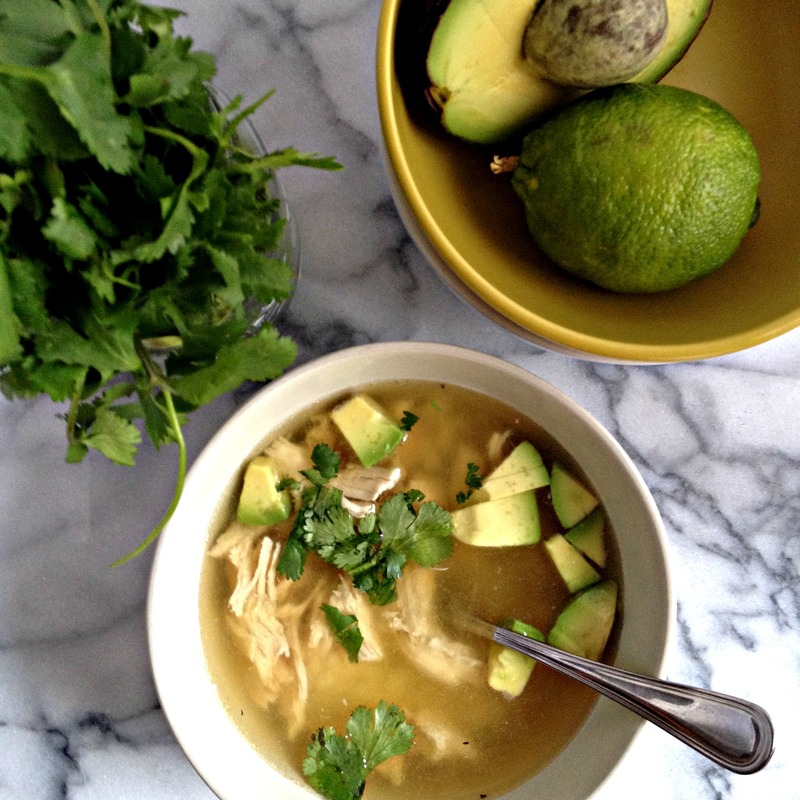 And making soups all day, every day, is tough on your creativity at times, so when I found myself with a fresh bunch of cilantro and a couple of limes, I decided to make a light Cilantro Lime Chicken Soup – broth based and bright with fresh flavors! If I have one recommendation for you this winter, it’s to make a huge batch of chicken or vegetable stock and portion it into two quart containers, freeze it, and rejoice in the fact that whenever you crave soup, it will be less than 30 minutes from frozen stock to hot soup bowl. This Cilantro Lime Chicken Soup recipe is as easy as poaching the chicken in the hot stock, adding some lime and cilantro stems (don’t throw those stems out when you use your cilantro, they are packed with flavor! ), and basically waiting for the flavors to meld together. Once ready, the stems are strained and you’ll add your pulled chicken, top with fresh avocado, cilantro leaves, and jasmine rice if you’d like. The perfect soup recipe to warm you up on chilly afternoons and nights. This Cilantro Lime Chicken Soup recipe is SO easy to make but the flavors will amaze you, so bright and herby! In a medium pot over medium high heat, simmer the chicken stock, water, chicken breast, cilantro stems, lime, and salt. Simmer until chicken is cooked, about 30 minutes. Strain the cilantro and lime from the soup and return soup to pot. Meanwhile, pull the chicken into shreds and return to the pot. Cook for 5 more minutes to heat through. Serve with jasmine rice, avocado, and fresh cilantro leaves.